Home / All News / Is attorney general really state’s ‘top cop’? Is attorney general really state’s ‘top cop’? “There is plenty of evidence for the public to conclude that Keith Ellison should not be the state’s top law enforcement official,” he said. Describing the attorney general as the state’s chief of law enforcement is no Wardlow invention. It’s used, for instance, on the introductory page of the StateAG.org blog run by James Tierney, a Harvard Law School professor and former Maine AG. But is it accurate, at least as outlined in Minnesota’s statutes and constitution? Probably not. At any rate, it’s hard to find any experts who think it is—including the office’s current and most recent past occupants. Ben Wogsland, spokesman for Attorney General Lori Swanson, said that while the office may conduct criminal prosecutions at the request of county attorneys, its original jurisdiction to initiate prosecutions is limited to Medicaid fraud. And even there, he said, the jurisdiction is concurrent with county officials’. Lacking primary jurisdiction, it’s hard to say the AG plays a chief law enforcement role, Wogsland said. It’s more properly regarded as the state’s “chief legal officer,” he said. “The attorney general’s office is not the top sheriff or something like that,” Wogsland said. “I never liked the term ‘chief law enforcement’ officer,” said Mike Hatch, Minnesota’s attorney general from 1999 to 2006. Early in his tenure, he avoided using the term altogether, he said, but people eventually wore him down. Unlike some sources approached for this story, Hatch is untroubled by Wardlow’s use of the term as a campaign catch phrase—even if it is wrong. “It’s not a top cop,” Hatch added. Still, the Wardlow campaign uses the phrase persistently enough that some concerned ears have perked up. That includes his DFL opponent, who says he is “extremely worried” about the manner in which Wardlow verbally frames the position. “The idea of a top cop is scary to me,” Ellison said in a brief Oct. 25 interview. “You will see vulnerable groups that he thinks he can ring the bell on,” Ellison said. For the record, Wardlow consistently has asserted that he would protect the rights of all Minnesotans and that his past work as a conservative religious group’s trial attorney would not influence him if he is elected. Ellison said he is also concerned that, by thinking of himself as the state’s top cop, Wardlow might push toward usurping county attorneys, whose job it is to prosecute most serious personal and property crimes. Wardlow consistently says he would team with local law enforcement and prosecutors and has pledged to beef up the office’s criminal law division to offer locals greater prosecutorial assistance where needed. Ellison has made the same promise. Richard Allyn, a former chief deputy attorney under both Warren Spannaus and Skip Humphrey and a partner at Robins Kaplan, is bothered by Wardlow’s characterization of the job—even if his conclusions aren’t quite as dramatic as Ellison’s. Allyn’s concerns are magnified, he indicated, by several of Wardlow’s statements captured on tape as he spoke to supporters. 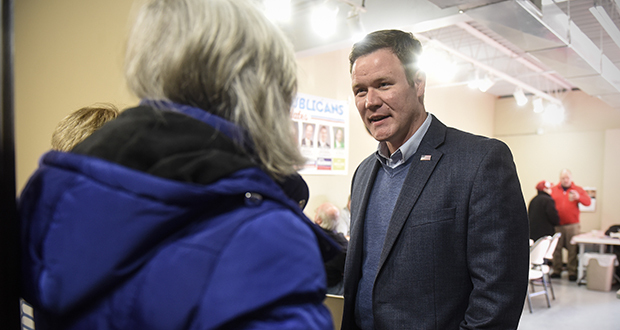 In one instance, Wardlow said he believes in a “second, unwritten constitution.” In another, he said he would immediately fire 42 DFL attorneys from the AG’s office and replace them with Republicans. Sen. Ron Latz, DFL-St. Louis Park, a former Senate Judiciary Committee chair, shares Allyn’s concerns. Latz previously worked in the attorney general’s human services and public safety divisions and says that Wardlow actively misrepresents to voters what an AG does. When Wardlow tells voters in the midst of an unusually high-profile attorney general election that he wants to be the state’s top cop who stands firm on the “rule of law,” Latz said, it sounds like a dog-whistle to conservative hard-liners. Latz said he does not know if state attorneys general have power enough to go rogue and push beyond the back-seat criminal prosecution and appellate roles specified in statute. But the question suddenly seems worrisome, he said. “It is, when you get an attorney general that fancies himself the top cop and the top law-and-order person,” the senator said. Others, Democrats and Republicans among them, are unconcerned by the candidate’s rhetorical flourishes. “I think it’s a bit of semantics,” said Rep. Nick Zerwas, R-Elk River, a member of the House Public Safety and Security Finance and Policy committee. While the attorney general is primarily a civil litigator and counsel to state agencies and the governor, and while the office mostly offers support to locals in criminal cases, Zerwas said the AG’s importance in enforcing and defending state laws can’t be understated. “Maybe a better moniker is the ‘chief law defender,’” Zerwas said. Sen. Warren Limmer, R-Maple Grove, the Senate’s Judiciary committee chair, said he thinks the terms “chief law enforcement officer” and “chief legal officer” are interchangeable. He said he has heard Swanson use the former phrase at law enforcement gatherings in the past, he said. He chided the past two AGs for cutting the office’s criminal division staff and joked that Hatch and Swanson may have lost their rights to claim the title of top cops. “I suppose if they eviscerate the law-enforcement responsibility of their office, they don’t really want anyone to reference the job as a chief law enforcement officer,” he said. Even if Wardlow is elected Tuesday and somehow tries to make himself the state’s top cop, Hatch said, he would be unlikely to succeed. Hatch speaks from experience. In 1999, he tried to pass a bill granting his office primary jurisdiction over Minnesota gang prosecutions. He ran into a buzz saw, with police and county attorneys from around the state descending on the Capitol to oppose him. Pete Orput, the Washington County attorney and former deputy attorney general who once did criminal prosecutions and appeals for the office, said he thinks Wardlow would face similarly stiff winds today. “I know that some of my colleagues would be very, very defensive about giving up their jurisdiction to an attorney general,” Orput said. Wardlow spokesman Billy Grant indicated in late October that he would make the GOP available for an interview for this piece. At press time, no interview had taken place despite repeated follow-up requests.